Morovision Night Vision proudly offers the PVS-7 Generation 3 PINNACLE® SOCOM Kit. The PVS-7 goggle is standard issue goggle type supplied to the U.S. Military and its allies. Equipped with a factory new, high-performance, ITT Generation 3 PINNACLE® image intensifier tube, the PVS-7 PINNACLE® night vision goggle is designed for the most demanding of night time applications. Battle-proven technology includes Automatic Brightness Control which automatically adjusts the brightness of the image tube to achieve the highest quality image resolution under varying light conditions as well as protect the user and the system against inadvertent exposure to excessive light. 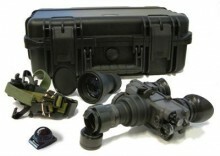 The PVS-7 SOCOM Kit includes the following accessory items in addition to the standard accessory items: IR Spot/Flood Lens, Magnetic Compass, 3x Military Magnifier Lens, PASGT Helmet Mount Assembly, Guardian IR Mockingbird™ Marker (User Programmable) and a Hard Shipping and Storage Case. System Data Sheet included. IR Spot Flood Lens - Allows the user to focus the diffused lR light source. Shipping & Storage Hard Case - Provides long term storage/and or shipping. Magnetic Compass - Displays compass reading directly in top of the night vision scene. 3x Military Magnifier Lens - Attaches to front objective lens of goggle. Magnifies view by 3x. PASGT Helmet Mount Assembly - Allows direct attachment of the goggle or monocular to the PASGT helmet. Guardian IR Mockingbird™ Marker - User programmable IR light source. Head Mount Assembly - Allows for hands free operation. Accommodates user’s head size and eye positioning. Medium & Thick Brow Pads - Changeable pads. Eye Cups - Prevents the emission of stray light or facial reflections. Soft Carrying Case - Provides convenient storage. Shoulder Strap - Attaches to the PVS-7 carrying case for easy portability. Sacrificial Window - Shields the optics from sand, air particles, or anything that may scratch the lens. Demist Shields - Snaps onto the eyepiece to prevent condensation from forming on the optics. Operator's Manual - Instructional users guide. Batteries - Two (2) AA. Data Sheet - System Test Data Sheet. Battery Life: 30 hrs @ room temp. Click the button below to add the Morovision PVS-7 SOCOM Goggle Kit Gen 3 PINNACLE® Night Vision Goggle to your wish list.